We’re pleased to provide a price quote for your next custom drapery project! The quote will include the yardage, labor, and lining (if applicable). We can also give you our drapery workroom price list, which will enable you to estimate the cost of projects while you’re meeting with your clients. We work on all types and sizes of projects – no job too big or small, too complex or simple. We offer free pickup and delivery, or you can have your fabric and supplies shipped to our workroom. 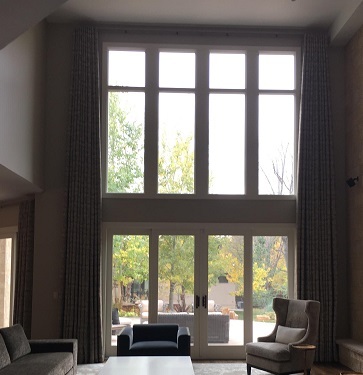 You choose the type of window covering you want, buy the fabric and accoutrements, give us the measurements, and we’ll be happy to do the rest! We work with interior designers, interior decorators, upholsterers, and other design professionals. We also have excellent relationships with retail stores that sell window treatments, furniture, furnishings, and home décor. If you own a retail store and have a designer on staff, we’ll be happy to work with you to provide custom drapery for your customers. If you need assistance helping clients visualize a window treatment, we can create a free custom rendering for you. You take a photo of the window, choose the fabric and the type of treatment, and we’ll create a realistic picture you can share with your client. For information about our custom drapery workroom, or to get a price quote on your next project, please e-mail contact@draperyworkroomdenver.com. Please make note: If you’re an individual homeowner who would like to get a price quote on a project, out of respect for our interior design partners, we can’t work with you directly. But if you contact us, we’ll be happy to put you in touch with an interior designer who can coordinate your project.